Preus Library subscribes to over 800 print journals and magazines. The Library also subscribes to 14 newspapers from the mid-west region and from around the country. The recent, or current, issues of these items are located on the Main Floor of the library in the Current Periodicals area. 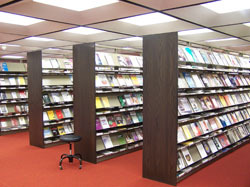 Journals and magazines are arranged in alphabetical order by title. Older issues, or back issues, from the Current Periodicals area are bound in hardcover volumes and shelved by their Library of Congress classification number with the books in the Main Stacks. Current and bound periodicals may be used within the library, and are not available to be checked out. Search WorldCat Discovery, the library catalog, to determine if we have a particular journal or newspaper.